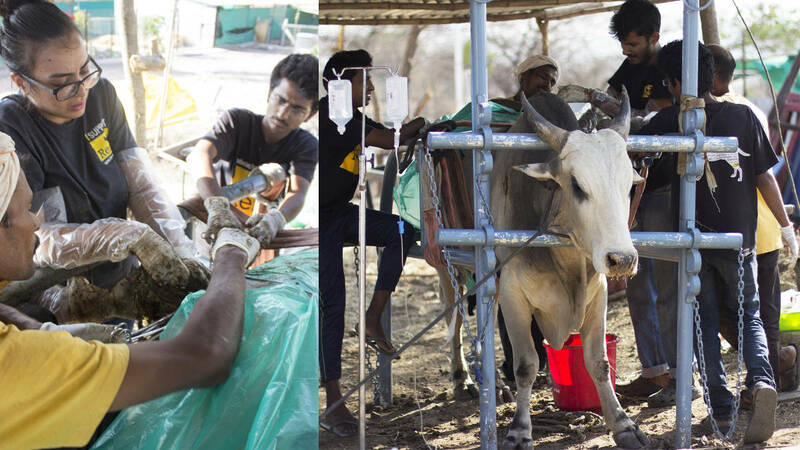 Today, we performed a Rumenotomy for Thenos aka Raja, the biggest bull under treatment at ResQ. Thenos came to us with a wound, which would’ve taken a few weeks to heal, at most. But his stomach was bloated and he was in great pain and discomfort. We performed surgery on him today, and the amount of garbage that came out was SHOCKING!! 47 KILOS, 3 bags full of garbage and plastic including Kurkure packets, Balloons, Jute Bags, Ropes, Rubber bands, Hairbands, Manja, Nylon threads and more. This is the 2nd Rumenotomy we’ve done this week. Several cattle (large animals) that come to us in a state where they’ve crashed and are not just standing up. Their bodies can’t withstand the amount of garbage that has been building up inside over the years. We are sure everyone here does our best to help street animals, care for them, feed them and make sure they have a good life. But as a COMMUNITY, we FAIL to pay attention to where our garbage goes, as long as it’s being picked up everyday from our homes. The harm caused to animals due to improper garbage disposal systems in Pune is scary. We’ve been realising it more and more with each animal that comes here. Don’t limit yourself to just stopping your car when cows and buffaloes cross the road. We could all stand to be more proactive when it comes to finding out where all our household waste goes. SEGREGATE your waste, RECYCLE, QUESTION your garbage pick up van where it is going, EDUCATE under developed areas around your Pune. A cleaner city, is a safer, for us and for the animals. We’re doing our best to clean out the cattle that comes to ResQ, help us help them live healthier lives. It costs us Rs. 5000 approximately do conduct one Rumenotomy surgery (including post-operative care. Share the word, donate, educate…help us, help them!